Everyone wants to be happy. But why does it always seem like happiness is fleeting? What if happiness is already here, right now, just waiting to be discovered? Tzivia Gover, author of Joy in Every Moment, believes it is. Whether it’s brushing your teeth, making a to-do list, running errands, preparing dinner, or stopping at a toll booth on the way home — every one of life’s events offers an opportunity to experience happiness. The exquisitely designed and inspirational Joy in Every Moment is a treasury of creative, doable ways to uncover little bits of joy in the course of the day that will add up to a lifetime of happiness. The book appeals to anyone who wants to feel more joyful, particularly those who might be going through a significant life transition. Basic instructions for stress-reducing techniques like meditation give these readers a boost. Readers can follow the daily routines page by page or flip open to sections that speak to them at that moment. A perfect gift for those ready to take the journey of mindful awareness, Joy in Every Moment acts as a life coach in a book. Gover shares relatable stories and inspirations from her own life and invites readers to discover the secrets of practicing daily happiness. What we need is a way to keep our inner balance through the trials of daily life. "Joy in Every Moment" workshops offer tips and exercises focusing on simple ways to add joy to your life and make mundane tasks meaningful. The approaches to creating a harmonious, conscious life vary from simple breathing exercises and meditation techniques to information on aromatherapy, feng shui, and yoga postures. ​﻿Joy in Every Moment workshops are predicated on the belief that happiness is already here, in this moment, waiting to be discovered. 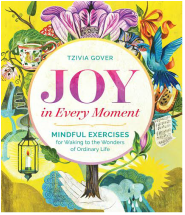 Author and educator Tzivia Gover shares a treasure trove of simple, fun—and sometimes surprising—tips and techniques to uncover rays of joy in even the most seemingly mundane moments. Using hands-on exercises including journaling prompts, breathing techniques, mini-meditations, and more, participants discover the gifts and gold that are available all day long. learn how to use PINS and Passwords to keep reinforce intentions and goals throughout the day. Be peaceful and relaxed in the midst of stressful situations. And more … Joy in Every Moment workshops can be tailored for most groups and settings.